Neither of those are the black diamonds which will be numbered to 60, the diamonds are darker when they are. This has got to be the number one thing people are asking about. I don't know who it is spreading that the base die cuts are #'d to 60, but I wish they'd stop. No stated print run on these, but they are rumored to be at least to a few hundred. See the difference? 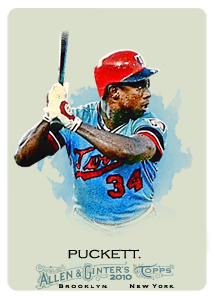 Topps doesn't identify it as a Black Diamond--both are card DDC-56--but there's a difference in the color of the diamond. 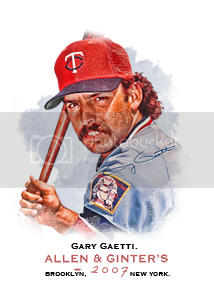 Collecting Gary and Joe Gaetti, Ozzie Smith, Kenny Boyer, Albert Pujols, Kirby Puckett, Joe Mauer,and Brian Dinkleman. PM me if you have something you don't need that I might! And if you want to friend me on Facebook, please let me know your online handle, since I may not know your real name! See the bolded? That's the number redeemed. Notice the difference in the diamonds. Right now, there are over 70 redeemed copies of each regular die-cut. So, no - it's not #'d to 60. The black diamonds have a stated print run of 60 and are "prize cards", meaning you get them shipped for free. The ratio so far has been right around 1 black diamond per 10 regular diamond die cuts. That ratio is pretty much across the board with die cuts. Given that, one would have to assume there are at least 600 of each regular die cut. This should be stickied. LOL! Nice Gwynn!! The last Gwynn went for a little more than $20 or so... kind of high for a /600! That's because I feel like a lot of people are operating under the assumption that they are all #'d to 60. Oh yes! I definitely agree. They will be $5 cards soon! I will wait for mine! Topps probably won't be shipping cards for at least 4 or 5 months (ala MCG). Even though they say they will be shipping (in a few weeks). Your choices right now are to either hold them or sell them on eBay and set up a trade with the buyer. How did you find the QTY? That's really helpful to know when considering a trade. - Go to the "Trade" heading and click "Trade your cards". - On the left hand side, select "Make offer". - Instead of selecting what you want to give up, click on "Card Search". It should be on the right hand side of the page. Just do a search using whatever qualifiers you want. Most of the time, putting in the player and year will do it. For the Die-cuts, you can pretty much just search for year "2011" to "2011" with no player name. It'll show you all of the embedded diamond cards and the die-cuts. Duh! It was right in front of me! Didn't put 2+2 together on that one!